"For several years I’ve written Christmas stories as gifts for friends. So it seemed natural to keep doing so, now that I’m published. 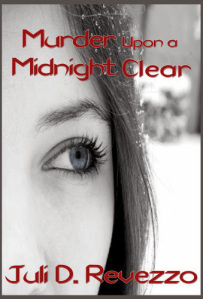 MURDER UPON A MIDNIGHT CLEAR, however, ended up bridging the gap between my unpublished and published world. It also had a different kind of huge gap to cover and this is what really inspired the story. There’s a stereotype in our culture that Christmas is always happy and bright, that Christmas Cheer keeps away the bad things of the world. I learned from personal experience this stereotype is just that. Statistics show that more people die this time of year than any other. I suppose that’s why our ancestors considered September to December the dark time of the year. So this worked into the creation of my story. What if, I thought, murder and mayhem visited a family? How would the family deal with the glow and cheer around them? Could there be a happy ending in sight for my hero? Could he and his family find a way to lift themselves out of the gloom that has descended on them? Driving away that darkness is a conscious, Herculean effort at such times. How do you do it? That’s the ultimate question and answer of MURDER UPON A MIDNIGHT CLEAR. Gloomy as it seems, life and death don’t stop because the Christmas trees are going up, neither do love and hope." ~ Author Juli D. Revezzo. Juli D. Revezzo is a Florida girl, with a love of fantasy, science fiction, and Arthurian legend, so much so she gained a B.A. in English and American Literature. She loves writing stories with fantastical elements whether it be a full-on fantasy, or a story set in this world-slightly askew. She has been published in short form in Eternal Haunted Summer, Dark Things II: Cat Crimes (a charity anthology for cat related charities), Luna Station Quarterly, The Scribing Ibis: An Anthology of Pagan Fiction in Honor of Thoth, and Twisted Dreams Magazine. Her debut paranormal romance novel, Passion's Sacred Dance, was recently released.